Available in Open & Closed Circut. Designed for use up to 6650cfm, the Falls Filtration DA Dry-type filter-silencer combines highly efficient cleaning of intake air with effective silencing, used on air intakes of blowers, compressors and naturally aspirated engines as well as many other uses. 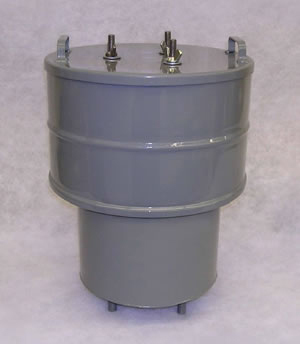 These units attach directly to air intake or can be remote mounted. The media consists of heavy Dacron felt with deep pleats, armored on both sides by galvanized steel wire cloth. A weather hood is furnished for protection against rain or snow. All metal construction materials are treated for corrosion resistance. Supplied with Dacron felt media, the DA dry-type filtersilencer applies where oil-free air and fine degree of filtration are required. Velocity of air through the filter can vary without affecting filtering efficiency. When servicing is required, the element can be quickly removed and washed in a commercial solvent. In most cases, dirt accumulations can be removed with an air hose or by shaking off the dust. The silencing chamber of the DA filter-silencer offers peak attenuation in the frequency ranges (see table below) heard at the intakes of compressors and engines.